A touching play exploring our evolving understanding of what it means to be a family. At times funny, provocative, and poignant, this drama follows Dallas matriarch Katharine Gerard on an unexpected visit to New York City to meet with her late son’s former partner, who is now married to another man and raising a young son. Forced to consider the life that her son might have led, Katharine must now come to terms with her own life choices. And certainly, society has changed around her. Wonderful acting underscores this quality production. 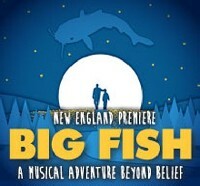 A warm and bountiful Big Fish centers on Edward Bloom, a traveling salesman whose larger-than-life stories of epic adventures delight everyone around him, except his pragmatic son Will. The show is full of terrific talent and melodious music. Just as Edward’s health begins to decline, the questioning Will sets out on a journey of family discovery seeking the truth behind his father’s fanciful tales. Award-winning directors Scott Edmiston and Summer L. Williams are also scheduled to be a part of the company’s 25th Anniversary Season. A Play of 21st Century manners, A Perfect Future tells the story of Claire and Max finding their values put to the test. When their best friends Alex and Elena announce they are having a baby, things begin to unravel in their perfect world. Claire is climbing the corporate ladder in advertising, while her husband Max is a puppeteer for PBS. With friends entering into parenthood, they begin to ask themselves who they are and where they are going so fast. And what happened to the indie-rock kids that hated everything their parents believed in? Set in a cage and creatively dramatizing different presentations forms, "Necessary Monsters" by John Kuntz is a play that tells a fragmented story. Its title figuring into at least four story lines. â€œNecessary Monstersâ€ is the name of a romance novel, a horror film, a bit of film noir, and a children’s television show. This is an unusual production that is part dream sequence, part pill-induced hallucination and serial killer nightmare. It is a provocative thinking person's entertainment. Don't let the title put you off. This is not a negative play. The narrative concerns the war between two cousins over a coveted family heirloom, It is a biting comedy/drama about religion and culture. At odds are the annoyingly self-righteous Daphna, a young woman who wears her Jewishness like a badge of honor, and her equally self-centered first cousin Liam, an entitled graduate student who enjoys distancing himself from his cultural traditions. Thrown into the mix is Liam's younger brother Jonah and Liam's white bread girlfriend Melody. When the combatants are forced to spend the night in a studio apartment, all hell breaks loose resulting in a viciously funny brawl over family, faith, and legacy. Set in the Eisenhower era of complacency and Norman Rockwell family and Main Street values, Far From Heaven is by the creators of the musical Grey Gardens and Tony Award-winning playwright Richard Greenberg, It is a a lushly operatic adaptation of Director Todd Haynes' romantic melodrama of private longings and social taboos. A beautiful 1950s Connecticut housewife's perfect life is shattered when she discovers her husband's secret and then seeks comfort in a forbidden relationship. The world is never what it seems.. Kids can be cruel. Hell, people can be cruel. Carrie White has always been an outsider. Constantly bullied and tormented at school and tyrannized by a fanatical religious mother, she begins to have hope that things will change when unexpectedly she is asked to the senior prom. But severe cruelty by her classmates is unleashed, and Carrie's terrifying and horrific power is her revenge. Not an ordinary whale of a tale, The Whale is the story of a rather pathetic Charlie. And he wants to make up for lost time. In the wake of personal tragedy, he has gluttonously eaten to assuage his grief and become a morbidly obese couch-bound, apartment-bound sad recluse. With his health ominously failing, he makes one last desperate attempt to connect with his estranged teenage daughter. Along the way, there are ingredients of Mormonism, costly medical insurance and online higher education as well. This is an exceptionally well-acted humorous, and emotionally wrenching play. Based on the book and movie, The Color Purple is a theatrical treat. The musical is about the trials and tribulations of Celie. Her abuse, hardship and cruelty begin when her abusive stepfather marries her off at the age of 14 to a callous man who separated her from her only true friend in the world, her sister Nettie. But with every reason to despair, she somehow clings to hope and waits for joy. The music and performances are outstanding. Kurt Vonnegut was an American original. This new play by Vonnegut and assembled by writer Nicky Silver touches a bit of ourselves. Like Vonnegut's other work it borders between farce and absurdism punctuated by wit, humor and at times empathy. With wonderful sets and terrific performances, this is about making and not making decisions, good, bad and life changing. Written in a time of self-help and lifestyle gurus and groupings, it questions the notion of "expert" therapy and the ramifications of not following strict adherence. Like all of Vonnegut's works, humor and humanity win out. Tribes is a brilliantly written play by Nina Raine that had its world premiere in 2010 at London's Royal Court Theatre. 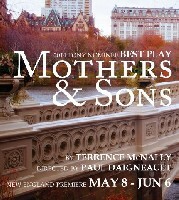 It tells the story of an overtly intellectual British family with a son who is deaf and his two hearing siblings. The deaf son Billy was purposely raised without knowledge of sign language. After meeting Sylvia, a hearing woman born to deaf parents who is now slowly going deaf herself, his interaction with her reveals the prejudices, beliefs, and hierarchies of his family. Here, hearing and listening are illustrated to be quite different. This may be one of the best dramas of the 2013-2014 season anywhere. The Boston Theater Critics Association (BTCA) announces its nominations for the 31st Annual Elliot Norton Awards. The awards, which recognize excellence in Greater Boston theater, will be presented on Monday, May 13, at 7 p.m. at the Paramount Mainstage, 559 Washington Street, Boston. Clybourne Park won the 2011 Pulitzer Prize and the 2012 Tony Award for Best Play. Filled with ironic humor, it is a brilliant drama about race, real estate and the volatile values of each. Inspired by Lorraine Hansberry’s A Raisin in the Sun, it transcribes racist American attitudes in two acts set 50 years apart. In the late 50s, a community is up in arms over the first black family to buy a house in their white neighborhood. Fifty years later, the neighborhood has changed around the same house, as now young white couples want to buy into the now predominantly black neighborhood. The social and emotional anxieties are mirror images. The writing and acting is sensational. This is great theatre. After a six year absence, the seemingly prodigal daughter returns to her conservative parents' home for Christmas in 2004. Brooke has been living and writing in New York, politically and culturally far from the isolated Palm Springs desert family home. Recently leaving rehab, her mother's sister Silda is now living belligerently with her parents. Brother TV producer Trip is there as well. It is at first an expected holiday character mix of a disfunctional family, but the drama becomes a whole lot more. This is a story of family, dignity and things that are not what they seem. With a diverse staff of contributors Berkshire Fine Arts strives for national theatre coverage. In this year end roundup we provide an overview with highlights rather than a top ten or best of list. There are numerous links to plays, features and interviews. Overal,l it was a great year that include a week in Chicago for the meeting of the American Theatre Critics Association as well as in depth coverage of the Berkshires and a taste of Broadway. Bloody Bloody Andrew Jackson recreates the life of â€˜Old Hickory' as a rock opera star. From humble roots on the Tennessee frontier to his days as our 7th Commander-in-Chief. Using an emo-rock score, the show tells the story of America’s first maverick president. He beat the British, decimated the Indians, overwhelmed the Spanish and eventually outpolled his political adversaries. This was all a function of his incredible ego and love of country. He was an American original. The American Repertory Theater (A.R.T. ), Huntington Theatre Company, and the Institute of Contemporary Art/Boston announce additional events and offerings as part of the third Emerging Americaâ€” an annual festival featuring groundbreaking performance by American artists June 21 to 24. Beginning May 11, SpeakEasy Stage will present the Boston Premiere of the hit Broadway musical comedy XANADU. This acclaimed show will be the company’s 100th production. The explosive family drama OTHER DESERT CITIES, the Pulitzer Prize-winning play CLYBOURNE PARK, and the Tony Award-winning musical IN THE HEIGHTS are among the five acclaimed shows that SpeakEasy Stage will present in its 2012-2013 Season, the company’s Producing Artistic Director Paul Daigneault announced today. In 2010, the deep and dark musical Next to Normal, with music by Tom Kitt, book and lyrics by Brian Yorkey, won the Pulitzer Prize for Drama. While a stunning work of literature, it would seem to be a hard sell for audiences for whom the notion of musical implies a light and easy, tuneful evening of song and dance. The stunning and galvanic production at SpeakEasy Stage Company brilliantly and inventively directed by Paul Diagneault with prodigious music direction by Nicholas James Connell was anything but that. Widely hailed as one of the best new Broadway plays, Time Stands Still is the story of Sarah and James, a photojournalist and a foreign correspondent, who are reeling after a recent brush with death while on an assignment. Will their relationship of nearly a decade be more threatened by a traditional go at domesticity than the roadside bombs of Baghdad? Winner of six 2010 Tony Awards including Best Play, Red is a glowing colorful portrait of an artist’s ego, ambition and vulnerability. After he lands the biggest commission in the history of modern art, first generation abstract expressionist painter Mark Rothko begins work on a series of large paintings (murals) assisted by a new young artist assistant. What takes place between the two men is a master class on the methods and purpose of art and the dynamic relationship between an artist, his creations and his life purpose.